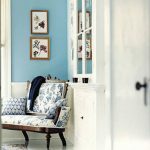 LOVE this pale, pretty Blue Seafoam color, and I'm impressed at how many turquoise and pale blue shades Benjamin Moore seems to offer. What a lovely image. the sea foam wall color is so beautiful with the white painted stairs. Also like how the chair was painted sea foam. hola erin!!!! that place is sooooo pretty!! !that colour!!!!!!!!!! !beautifulll every day l love it more!!!!! un beso enorme!!! What a welcoming entryway! Love it! I wish I knew the Dulux equivalents of Benjamin Moore paint colours. This shade of blue is lovely. Reminds me of the blue shade I used in the armoire of my studio. I'm also a huge fan of the floorboards. 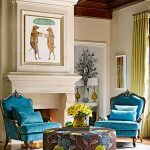 I can feel my blood pressure ease just looking at these turquoise bedrooms. Nice! Such a gorgeous color with those floors! Oh it's so pretty – perfect for a beach house! Really tempting. 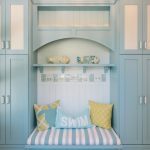 I like House of Turquoise! 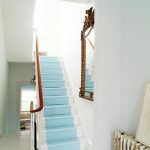 I love that sparkling clean color mixed with the distressed condition of the staircase! I also love seeing exposed wood sometimes, too. It seems like I always want to paint over everything! The scene reminds me of somewhere you would walk into to get a glass of lemonade after working in the yard, or coming from the beach! Great image 🙂 Love the paint color & wood plank floor.